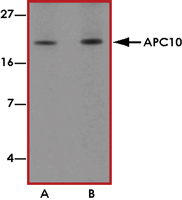 Sample Data :Western blot analysis of APC10 in mouse heart tissue lysate with APC10 antibody at (A) 1 and (B) 2 ug/mL. 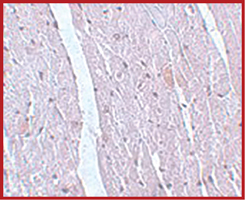 Sample Data :Immunohistochemistry of APC10 in mouse heart tissue with APC10 antibody at 5 ug/mL. 3. Passmore LA et al: Doc1 mediates the activity of the anaphase-promoting complex by contributing to substrate recognition. EMBO J.2003; 22:786-96.